I love throwing plenty of herbs and spices into what I cook. Not only do they taste so good … they offer so many heath benefits … and they stimulate digestion … and help with weight-loss. In clinic I’m often encouraging women to eat more vegetables specific to their needs. For me that encouragement always goes hand in hand with food that tastes good, so that healthy eating becomes delicious eating too. The way I use herbs and spices depends on flavour and also I think about the health benefit. As an immunity booster I go immediately to ginger, garlic and turmeric. I throw these spices into so many of my dishes. In my 8 week program, which is all about eating for female hormone balance and vitality, I use a lot of these immune-boosting spices as they are also anti-inflammatory. This means they help to improve hormone balance as well (and great for the skin). Did you know just one teaspoon of dried ginger per day, eaten with food, has been shown in studies to help alleviate menstrual pain. Currently there are a number of studies being done to see if herbs and spices can be effective in stopping cancer cells from growing. Spices such as chilli/cayenne, turmeric, cumin, ginger, black pepper and saffron are showing really interesting results in the latest research. In some research about breast cancer the active ingredients in ginger, garlic and cumin are being looked at for their potential benefits. I’m very focused on gut health and really zoom in on trying to make that the best functioning organ it can be! So often I use herbs and spices, as well as other foods, to bring healing along. As an anti-bacterial, anti-fungal boost to the gastrointestinal tract I like to use cloves, oregano, thyme, garlic and rosemary. My online program also focuses on the gut, as well as weight-loss and vitality, using a balance of herbs and spices to help keep the healing and taste sensations going throughout. One of my favourite go-to spices is Moroccan Ras El Hanout because it tastes so great and offers anti-inflammatory, anti-bacterial and blood glucose balancing spices all in one blend. I often add it, along with some extra virgin olive oil, to softly cooked onions; garlic and wilted spinach. Stirred through with smashed chickpeas and roasted crushed almonds. The spices lift this simple dish to another level of deliciousness. Below is another favourite recipe of mine, Spicy Calamari with Okra, which uses some of these spices. 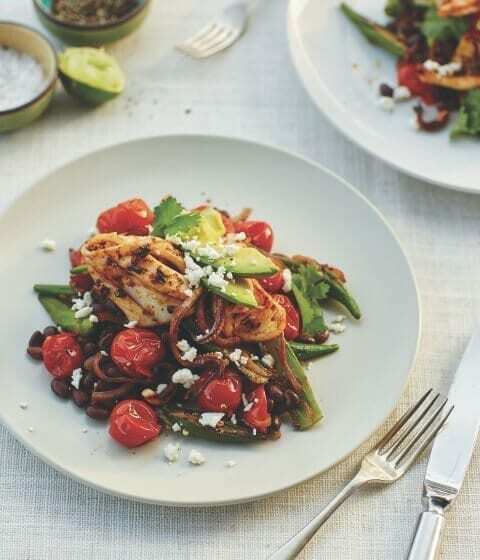 This recipe has so much going for it – giving the body protein found in the sustainable calamari and black beans, great anti-inflammatory benefits in the avocado, olive oil, spices and calamari (yes calamari contains some omega-3 oils) and gut-loving fibre in the black beans, avocado and okra … and the spices make it taste great! Serves 2 but can be easily multiplied for more. Cut the calamari into large chunks or thick rings and toss with garlic, chilli, salt, pepper, coriander, paprika and oregano and 1 tablespoon of oil. Leave marinating in the fridge whilst you cook the vegetables. In a large frying pan/skillet add the 2 tablespoons of oil, okra and onions. Fry on medium heat, stirring frequently. Once the onions have softened, after about 5 minutes, add the tomatoes. Cook until the tomatoes begin to soften and break up. Then add the black beans to warm. Divide the vegetable and black beans onto 2 serving plates. Wipe out the pan and heat on high, adding the calamari once the pan is hot. Sear the calamari until it is just cooked and firmed up, about 1 – 2 minutes, stirring occasionally. Place on top of the vegetables, squeeze over the lime juice, crumble over the feta, and scatter the coriander and avocado. MEET EMMA I am a qualified nutritionist, nutritional therapist and experienced chef . You can trust in my work and feel confident that you’ve found the right person. I will guide you through your own nutritional journey, from plate to vitality. I use evidence-based nutrition advice, constantly learning through professional education and research. With over 20 years cooking and nutrition experience, I combine a scientific approach with a real understanding of food. You can expect meals that are easy to prepare, taste fantastic and are rich with nutritional benefit!